Both comforting and revitalizing, miso soup is traditionally drunk as an accompaniment to most Japanese meals. 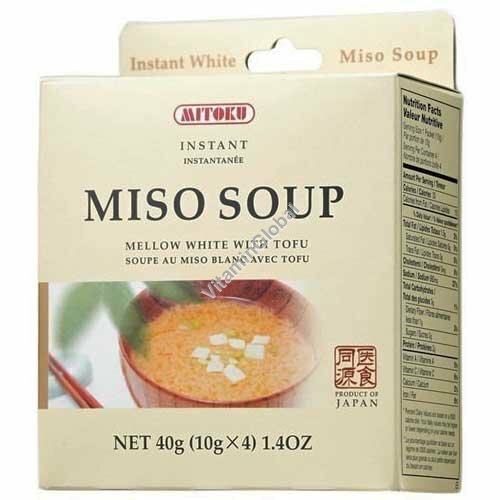 Mitoku instant Miso Soup made with white miso and tofu has a gentle and slightly sweet flavor. Ingredients: Freeze-dried Miso (89%) (soybeans, rice, sea salt), dried green onions (7%), freeze-dried Tofu (4%) (soybeans, Kuzu, Nigari). Preparation: Empty one sachet into a bowl. Pour a cupful of hot water on top. Stir well and leave for a minute before enjoying.